I do not know when I started working on PowerPoint projects, however I do know that I worked on them many years before I learned even the simplest programing in AutoIt. I mostly made PowerPoint presentations as birthday presents for my relatives. I later moved onto to use Open Office Impress. Below are a combination of files that have been converted back and forth between the two formats, for transfer and saving purposes. Because of this, some of the images, and almost all of the sounds and now lost. What is it, and how does it work? This project was my last major project in PowerPoint. I made this project for my brother who was turning 21. The idea was to create an interactive PowerPoint presentation that had 1 "floor" for each year. The main animation used in this project is the elevator doors. Each floor starts with elevator doors opening. At the time this was a very impressive animation for me, as it used several rectangles that all had to fit together perfectly, or else the opening, or closing animation would be very obviously messed up. This was also the first, and only project I made that had any kind of story to it. As you go through each "floor" of the "building" you are shown different things. 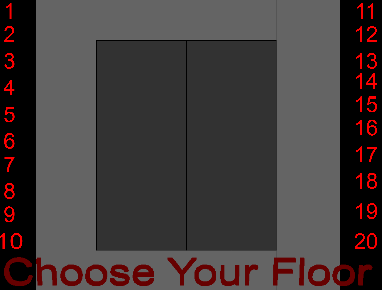 Most of the floors show some text and a picture from Google-images. However, some of the floors have text fade in and out of them to tell some sort of mystical story. As you can see in the picture above, there are only 20 choices for floors, but this presentation was for my brother's 21st birthday. The 21 first floor is an epic battle with a monster. To get to this fight scene click on the top center rectangle that makes up the frame of the elevator. This project has several major key components that make it work. The first one is the elevator doors. I believe that they do a wonderful job representing the illusion of actually going somewhere, and not just moving from slide two to slide two. The second key component is the few graphics that I have. Most, if not all, of the graphics of the fight scene are from my brother's game ARENAnet , however some of the graphics, such as the hotel, and some of the text were made using the 3D tools of Open Office. The final component of this project that really helped to tie everything together was the fight scene at the end. Unlike other projects, such as my Poker-Stars project, the user had actual options in this scene. The options were rather small, but choosing one, would actually take you to a different part of the presentation. When it worked perfectly, the project had music that would run, as you changed floors, and sound effects that would play, on certain clicks. Unfortunately the music and sound did not transfer from computer to computer well, and has been lost. This project is a very basic simulated Poker-Stars environment. The game is entirely pre-set, and has no random change or luck. It is very hard to simulate random change in PowerPoint/Impress. There are 2 files that make up this project. One file is the completed project, the other is one step before the completed project. In order to make buttons that both looked like actual Poker-Stars buttons, I created completely transparent buttons over the buttons in a fixed image. However, I found that it is impossible to select completely transparent buttons. So I kept all the buttons as blue boxes until I was absolutely certain the project worked, and I was done, at which point I changed the color of all the buttons to transparent. At the time of making this program my brother was really into Poker-Stars, and was playing 16 tables at a time, everyday. With his birthday coming up I decided to try my hand at making a simulated Poker-Stars environment. At the time however, my only programing ability was some very basic macro scripts in AutoIt, such as loading a series of programs, or entering the cheats codes into a video game. 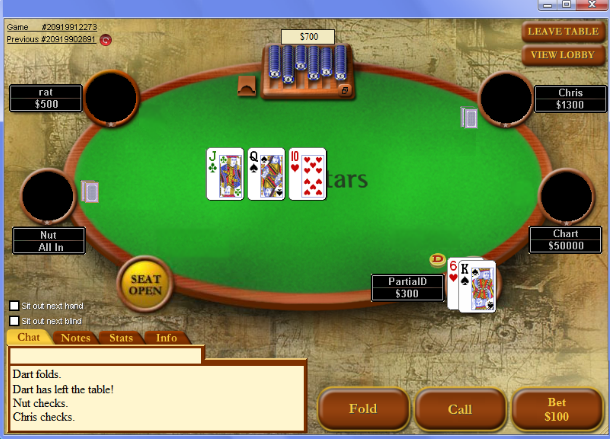 To make this project I opened Poker-Stars and went to a table, took a few screen-shots and left. Through those screen-shots (which I unfortunately no longer have) I put together about 10 different situations. To edit the pictures, I used the only method I knew how to, which at the time was through Microsoft Paint. Through small manipulation, over a very long time, I was able to remove or change all the text, and delete the images. The final project was a very small and short simulated game of Poker-Stars using the Open Office Impress environment. The original project had music at one point, but music does not transfer from computer to computer, and the music was lost. Unfortunately the 2 project files, are huge. In order to make all the images synch up properly I added a huge amount of black space to all the images, so that I could move images around and not worry about noticeable changes from screen to screen. This project was a birthday present presentation that I made for my mom's 50th birthday. This project was rather simple, however the combination of the images and the music that I used (which unfortunately is not included with the project) made this project memorable. This project does not use any particularly interesting animations, however the ones that it does use are very smooth and fit together very nicely with the atmosphere of the presentation.